Since 1977, we have always focused on treatment excellence for those we serve. Boise Sports Chiropractic Clinic is passionate about working with community members from all walks of life and suffering from a wide range of disorders. We welcome everyone dealing with typical back and neck pain, or those enduring painful headaches. Our chiropractic care center also invites weekend warriors and athletes wishing to optimize their sports performance. We often accept difficult cases that other doctors cannot help; it is our purpose to provide fast pain relief with consistency and efficiency. Our vision is to balance the entire body through the feet and extremities, and not just the spine. Most people do not realize the importance of optimal foot alignment and how its absence can create mechanical dysfunction. There was a time when human beings primarily walked on dirt surfaces, which indented and adapted to the many shapes of our feet. Soft shock absorbing dirt has been replaced by hard surfaces, such as asphalt, cement and hardwood floors, and those surfaces no longer adapt to us; our feet must yield to them. It is our sincere hope that our patients recognize that they can usually be helped. We understand what you are going through, and we will take the time to see you through it. We want to partner with you to the other side where you are once again feeling healthy and full of vitality. We think you will be pleased to know that it only takes a typical patient 4-6 visits to regain their health and function. Dr. Hearon believes in quality over quantity. Because he’s an internationally renowned specialist in the field of chiropractic extremity adjusting, he has the tools and expertise to usually provide fast and reliable results. We provide many services under one roof, from sports and occupational injury care to customized orthotics. We also feature on-site X-rays. Our experienced care is supportive and patient-centered. 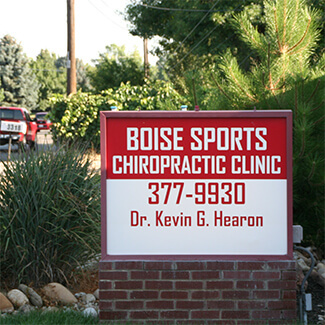 Contact our Boise practice today for a convenient appointment!